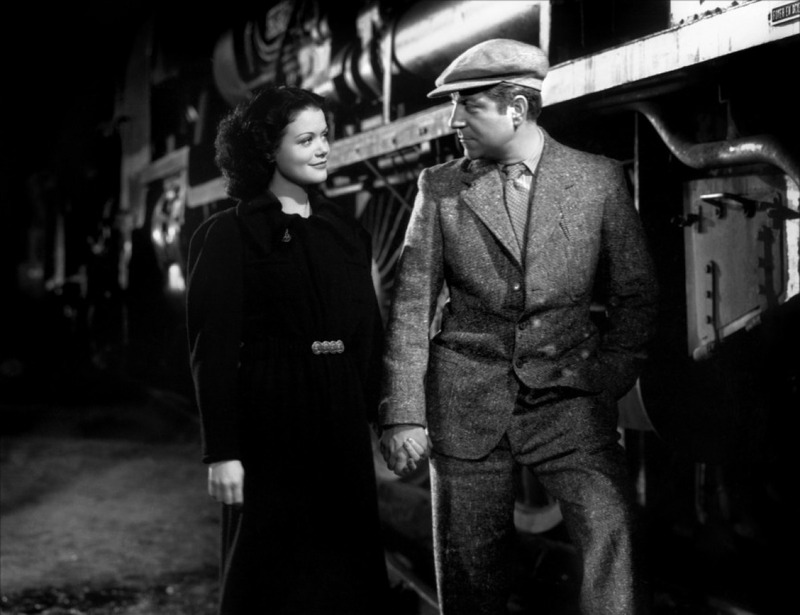 To associate the creamy, reflective and rather introspective quality of Caron's Nuit de Noël (Christmas' Eve) with the naiveté and relative innocence of a Parisian Christmas' Eve Mass is to misunderstand it. If anything, it's a scent of late November, when huge plates of seductive marrons glacés start being displayed at the Viennese Café Bräunerhof, all starchy comfort and glazed vanillic sweetness, chased away by a shot of bitter Fernet Branca after a hearty meal. 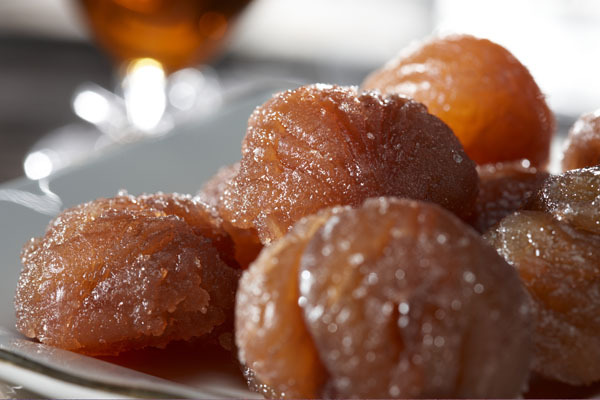 I'm instantly reminded of La dame aux Camélias (1848) by Alexandre Dumas fils, where marrons glacés were the only type of confection that the courtesan Marguerite Gautier would eat. Her clients were expected to buy bags of them for her to enjoy. Personally I expect my own admirers to gift me with Caron's Nuit de Noël instead; the two are closely linked in the amount of pleasure and allure they exude. Nuit de Noël, composed by the founder of Caron, self-taught perfumer Ernest Daltroff, in 1922, is rumored to have been suggested by his longtime partner, Félicie Wanpouille, who adored Christmas Eve and the scent of warm furs and incense. The black Baccarat botte with the golden frieze (like a flapper's headband) is forever associated with the Roaring Twenties, but the scent itself seems at odds with its times and partly its name; even though the intensely warm scent is as pliable and soft to the touch as the softest sable, a parfum fourrure indeed (with the more innocent meaning of the two), its mood is neither one of uproar nor of traditional Christmas smells (cinnamon, spices, pine, gingerbread, incense).Many insist on wearing it at Christmas' time, none the least of which is perfume collector and connoisseur Roja Dove and fashion designer Karl Lagerfeld. Caron's Nuit de Noël (1922) is a soft oriental built on an accord of rose absolu and Mousse de Saxe perfumer's base (i.e. a ready-made accord of ingredients producing a specific effect), with the addition of 25% sandalwood, jasmine, ylang ylang, lily of the valley, vetiver, amber and iris. It's prismatically constructed around 6-isobutylquinoline, a leathery molecule. The fragrance emits a cozy, inviting scent poised between the starch of marrons and the bitterness of the iodine/leathery note (hence my Fernet Branca evocation) fading into musky woods. Indeed the famous "Mousse de Saxe accord" is comprised of geranium, licorice (created with anise), isobutyl quinoline (leather notes), iodine and vanillin (synthesized vanilla). If older Carons, especially in their superior vintage form, are characterised by a signature "Caronade", a common thread that runs through them, Nuit de Noël is a good place to start this escapade into one of the most chic and historical French perfume houses. Less incensey than similarly oriental Parfum Sacré, less abrasive or bold than straightforward leathery En Avion or Tabac Blond, Nuit de Noël has a sheen that starts and ends on an unwavering tawny pitch. The spiced rum-licorice notes aplified by musk (a musk comparable to that in Chanel's No.5 and Bois des Iles) take on a rich saturation; the fragrance dries down to a powdery warmth redolent of the bourgeois scents of a festive evening spent outdoors. The modern Eau de Toilette has taken a rosier take than the one in my vintage bottle from 1970 which seems oilier and darker in mood, with a heavier dose of ylang ylang. The Nuit de Noël extrait de parfum plays more on the leathery, woody notes of the Mousse de Saxe base, lasting for a whole night till the next morning; when you wake up and smell your pillow with all the longing of a passionate lover who is already missing what he has just now savoured. 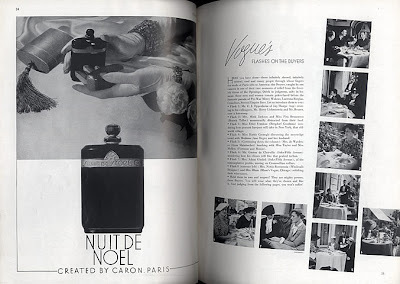 Related reading on Perfume Shrine: How to Date Caron's Nuit de Noel bottles, Caron news & reviews. I had a sample of vintage extrait that I loved. But when I tried the modern edt I wasn't as impressed. I thnk it's really the Mousse de Saxe part that I dig. I'm hoping that if I can get a sample of the modern extrait it will live up to your wonderful description. Thanks for the review. Thanks for the great description. I've always been intrigued by the description of vintage Carons, but have been dismayed at the current Frayssed versions. NdN is actually one of the few I like somewhat also in the modern edt, which I have. Nuit de Noel parfum, then! glad to have others agree with me. It's as you say, we have been conditioned to expect yuletide, so the spontaneous response "where's the Xmas in it?" is one that is expected and rather predictable. I hope you do find a bit of the extrait as most Carons are deliciously good in that concentration (even many modern ones). The boosting of rose can be a little dangerous, I personally believe: to many of us it can bring on instant images of dusty, old pot-pouri; not a good thing. as you say, compared to others, the modern NdN isn't bad. The extrait is superior (do locate some, please) and the vintage richer, but one could do much worse than the current edt, so enjoy!! the gift of beauty that you provide through this blog. I've sent friends who don't give a fig about perfume here because it is such a treasure of so many things, not the least of which is brilliant writing. I'm wearing Nuit de Noel today, and enjoyed this piece. better late than never...here I am. Thanks so much for your wonderful compliment and for recommending the site to your friends. Hope you have a wonderful festive season! I am stunned at coming across this post. I posted yesterday about what one thought of to wear during the holidays, and I said the Original Salvadore Dali, and how it evoked my mother. I knew there was another perfume bottle there, and it had to do with Christmas, and this is it. I think my mother's a tassel on it. I found some paintings of Dali's where he described the background of the images, that they were a tribute to the nurse who raised him and the trees and scenery. When I looked at those pictures, his perfume came visibly alive. What a joy it was for me to realize such a thing was possible. Your mother's bottle can be seen on this Caron Nuit de Noel bottles link. Nice memory, eh? Have worn this gentle perfume for over 30 years. It doesn't overpower, and I had a friend whose nephew called me "the lady who always smells so nice". this from a 12-year=old!